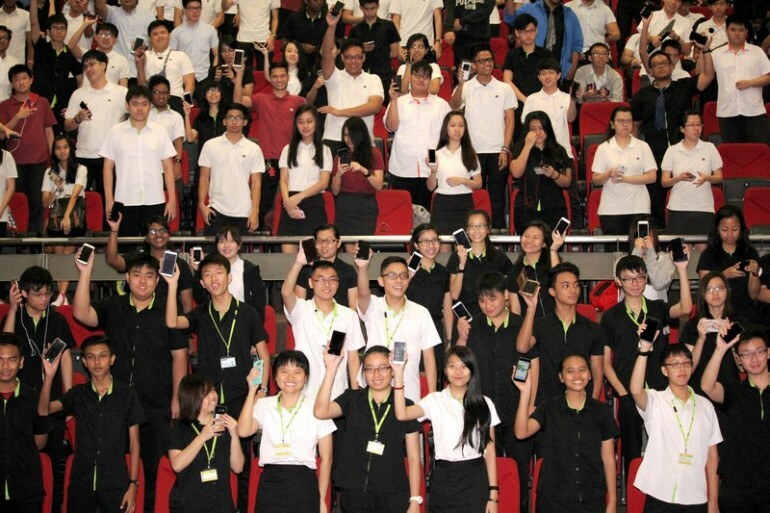 SINGAPORE – 11 April 2016 – Microsoft today conducted coding workshops for some 700 ITE College West students under its Code for Change programme, introducing them to the basics of coding for app creation and computational thinking. Held over two sessions for students across the four schools at the College – the School of Electronics & Info-Comm Technology, School of Hospitality, School of Engineering and School of Business & Services – the workshops provided students across various fields of study with the opportunity to learn and share the experience of coding alongside their peers. The activity also marks the first large-scale on-campus training for post-secondary students under the Code for Change programme. Launched in July 2015, Code for Change is a three-year nationwide initiative spearheaded by Microsoft, supported by the Infocomm Development Authority of Singapore (IDA) and the Science Centre Singapore, to boost next-generation talent development in support of Singapore’s Smart Nation vision. Through Code for Change, Microsoft is leading specific programmes to help young talents nationwide develop computational thinking skills. Defined as the ability to dissect problems and formulate solutions in a way that computers can understand and evaluate, computational thinking is an increasingly important skillset in the technology-permeated landscape. During the workshops held today, the ITE College West students tried their hand at building apps through Touch Develop, an interactive programming environment developed by Microsoft Research. Using their mobile phones or laptops, the students were exposed to how they can easily code on familiar everyday devices in a fun and accessible manner. The workshops were designed to allow all students, regardless of knowledge of coding or course of study, to create their own app by the end of the session. Besides those enrolled in the four courses from the School of Electronics & Info-Comm Technology (Higher Nitec in Information Technology, Higher Nitec in Cyber and Network Security, Higher Nitec in Electronics Engineering and Higher Nitec in Security System Integration), ITE College West students who participated in the training also come from other fields of study including the Higher Nitec in Hospitality Operations course from the School of Hospitality, the Nitec in Automotive Technology (Light Vehicles) and Nitec in Automotive Technology (Heavy Vehicles) courses from the School of Engineering and the Higher Nitec in Leisure & Travel Operations and Higher Nitec in Service Management courses from the School of Business & Services. “As Singapore transforms into a Smart Nation, it is important for the workforce of tomorrow to understand how technology works and how it can be used to improve the way we work, live and play. Coding and computational thinking are no longer areas that are important only to those in the Science, Technology, Engineering and Mathematics (STEM) fields. In fact, computational thinking is also embraced for its wide applicability to solve everyday problems. We are proud to be able to work closely with partners, schools and institutions such as the ITE to introduce coding to even more students and equip young talents with the necessary skillsets to become innovators of the future. Through Code for Change and our other initiatives, Microsoft will continue to get more people started on their coding journey and contribute towards the development of computational thinking as a national capability,” said Nobuhiro Ito, Director, Developer Experience & Evangelism, Microsoft Singapore. “As we prepare our students to be ready for their careers, we hope this coding workshop will help them develop computational thinking skills such as analytical and problem solving skills, creativity and logical thinking. These skills are transferable assets across industries and will certainly allow them to contribute more in their future jobs,” said Tan Kay Chuan, Director, School of Electronics & Info-Comm Technology, ITE College West. Since its launch last year, Code for Change has reached over 147,000 learners and youths through various coding programmes such as learning experiences through on and off-campus curricula, events and competitions that impart the fundamental concepts of programming for software, applications and websites. Examples include Kodu coding workshops for lower primary students, Hour of Code programmes for upper primary and lower secondary students, Touch Develop and Project Spark workshops for secondary school, post-secondary and junior college students, and the Microsoft Imagine Cup Competition for institutes of higher learning. Microsoft and Science Centre Singapore also joined hands to achieve a record-breaking feat that made its way into the Singapore Book of Records for the Largest Number of People Wearing Illuminated LED TShirts. The event saw over 180 students from 17 schools across Singapore, as well as participants from Microsoft and Science Centre Singapore, come together to design and code individual LED T-Shirts, which lit up in unison to complete the record-breaking milestone. In addition, Microsoft has leveraged its partner network to conduct coding workshops for students and adults at Science Centre Singapore, and support Science Centre Singapore’s efforts in fostering widespread interest in the STEM fields.